Following are reviews from the Abacus Lennox dealer webpage. Abacus’ HVAC technicians are licensed and authorized to inspect, maintain, repair and sell Lennox systems. As a Premiere Dealer, we must hold to and maintain certain levels of training and customer service in order to maintain this status. The Technician came out promptly, was extremely knowledgeable and friendly. We respect the fact that he didn't try to up sale us or call our old unit DOA... he gave us options to decide for ourselves. He answered all our questions about the various units from which to choose. 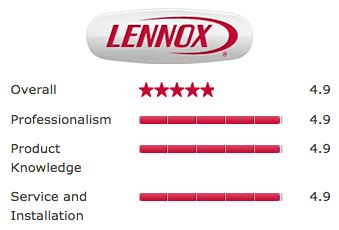 My husband and I did research on all the various different units and manufacturers... we discovered that Lennox is the top performer, plus their 10 year warranty! Now ALL rooms in our home are comfortable and cool without needing the assistance of the ceiling fan on full blast. Abacus and Lennox are two names that speak for themselves because of their impeccable reputations. The bonus of our system is that it controls not only the cooling of our home but the humidity inside our home as well and can be controlled by our phone. And an added bonus... it's quiet! (That's right...the unit can barely be heard, from the air intake inside the home to the fan on top of the unit outside!!!!!) Hey, that's how I shop...ALL appliances in our home must be QUIET! And our Lennox is very quiet! The entire team of Abacus were friendly, helpful, knowledgeable and respectful of our home, from the customer service reps to the HVAC Tech to the crew that did the installation. We were glad to see all the workers in uniform (except one did not have a uniform on) and all the vans had Abacus on them...it's important to know WHO is in our home. “They installed a complete HVAC system in our home, on a Saturday, in only 5 hours! Watching their team work together reminded me of watching an orchestra perform, with each person demonstrating precision, expertise, and professionalism. “I used abacus last week to replace two 15 year old Lennox units with new 16 plus seer units.